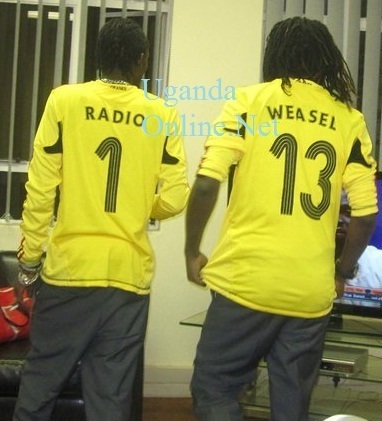 The 2013 Bet Nominees, Moze Radio and Weasel TV will be performing live at the Big Brother Africa first eviction show this Sunday. The Obudde stars will perform a few minutes before we know if Uganda's Denzel who is up for eviction leaves the house or Africa gives him a chance to continue entertaining. Confirming this development, the Goodlyfe Crew were asking their fans which songs they should be performing during the show; "We are in the Big Brother House for the first eviction show this Sunday. What songs should we play?" Most of the fans seem to be suggesting 'Magnetic' and 'Obudde'. Ugandan artistes who have performed at the Big Brother Show include Jose Chameleone (2007), Goodlyfe and Keko (2011), Maurice Kirya in 2012 among others. The 'One & Only' star performed last year during the Big Brother StarGame being the first East African artist to perform at the Grand Finale show. Just last week, Moze Radio, Weasel and his Norway based girl friend, Carol Serwadda were in South Africa where the Goodlyfe Crew had a number of performances. "Good things happen to good people, It's too late for anyone to stop us," The boys tweeted after confirming this development. This week, Ghana's Selly, Malawi's Natasha, Uganda's Denzel, Ethiopia's Betty and Kenya's Huddah Monroe are up for eviction. To save Denzel, send an SMS with a name Denzel to 7626.